Winter fishing hints at frozen fingers and bitter winds, but it also opens up a whole new world for those anglers brave enough to face the cold. Some fishermen decide to head south to get a reprieve from the cold weather, but others decide to get out onto the ice as soon as it’s humanly possible. Winter fishing is rewarding because your favourite fishing spots will be much emptier than usual, as other anglers prefer to go hunting or just put away their rods for a while. Ultimately, there’s more fish for cold weather anglers and you can enjoy the wilderness in peace. The more popular choices for winter fishing are bass, muskellunge, perch, catfish, northern pike and crappie. 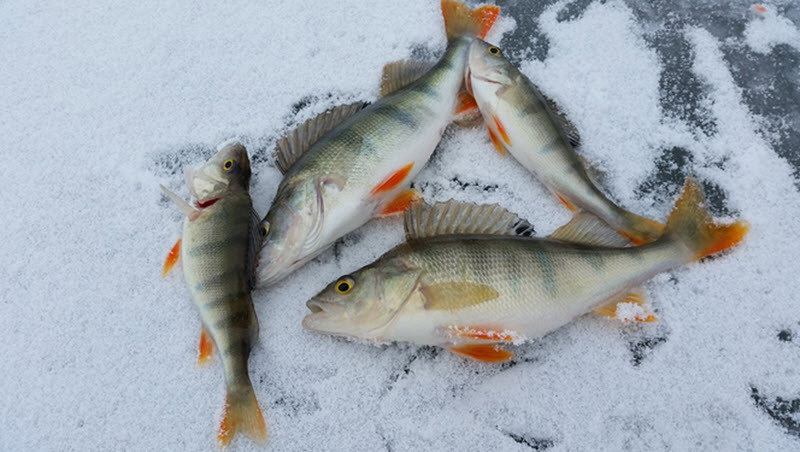 Winter fishermen make it a point to keep their lure moving in the water because fish are much slower in cold weather. Fishing is always a patient man’s game, but even more so in winter when you must leave your bait in the water for much longer to get a bite. Fish might be grouping up in deeper water as they prepare to hide out for winter, but even in cold water they still have to feed. The important thing to look for is deep water when you’re trying to find these schools of fish. Even as you head for the deepest part of a fishery, it’s also crucial to keep in mind what time of day to go fishing. In winter, fish will take advantage of the warmest times of the day to get some food, so you need to be there with your fishing rod during that short feeding window, which is generally first thing in the morning. Winter fishing is also a good time of the year to catch the biggest fish of the season, especially with bass. Everything in fishing is slowed down, as the fish themselves will be much slower; however, competition is the law of the jungle – or in this case, the law of the lakes and rivers. No matter the temperature, the fastest fish in the school will get to your lure first, and whilst in the warmer months, smaller fish are more active than larger fish, in the cold months all fish are lazier, thus levelling out your chances of getting a big fish on your line. In warm weather, fishing is all about getting a reaction bite from the fish you’re after. Fish are more active, therefore more likely to go after a bait that catches their eye quickly. In winter, fish are lazier, and their reaction times are massively slowed down, so fishermen stay away from flashy lures and baits and use more subtly coloured soft plastics. Last but not least, how you fish also changes in winter – again due to the slow reaction time of fish in cold temperatures. Reaction-bite fishing that reels in fish in summer won’t work in winter, so fishermen use a method called ‘soft plastic fishing’. This involves dragging the bait along the bottom and moving it upwards at regular intervals, but very slowly to allow slow fish to catch up.